Muammar al-Gadhafi, the current leader of Libya - at least for the next few hours, can be seen here giving the "Thumbs up" emblem - which in the majority of countries and regions of the World is a clear and unequivocal indication of positive emotions. But this does not tell the whole story. Like most leaders (or those in leadership positions), Muammar is fairly skilled at disguising his true feelings; but what is covered up in one area will leak out in another. 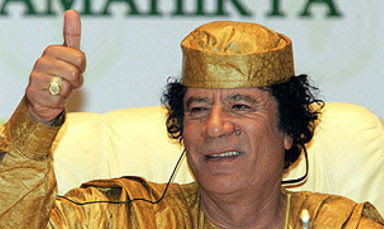 Gadhafi's face displays mild-to-moderate levels of Contempt. The left side of his mouth is elevated and his lip is curled. The "mustache" area is also tightened and his left nostril is also dilated. These are all clear indications of Contempt. Whenever a positive gesture (here thumbs up) is displayed along with a negative expression (contempt), it is the negative one which indicates the true emotional state.